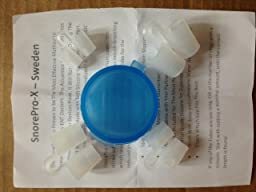 I used the SnorePro-X Advanced Anti Snoring and Sleep Apnea Device last night for the first time. I loved them. It was the first night in a long time I didn’t wake up with a sore throat from snoring. They fit comfortably in my nose and I did’t really feel them there at all. I was amazed at how I instantly felt like my nasal passage was opened up and I could breathe better.